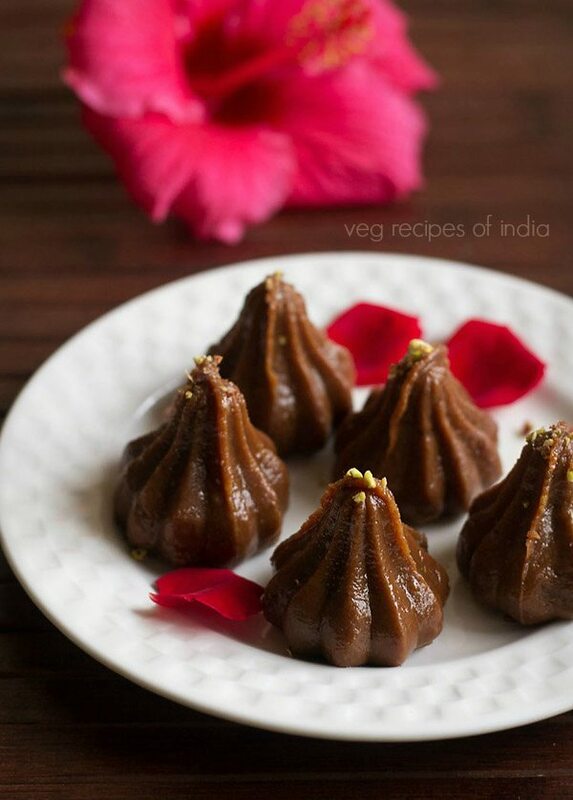 chocolate modak recipe with step by step photos - easy recipe of chocolate modak. 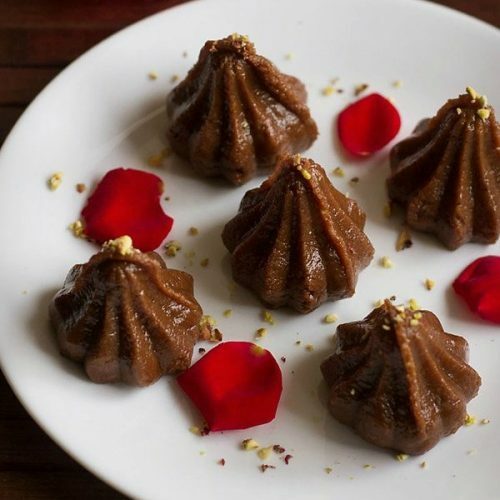 chocolate modak recipe with step by step photos. 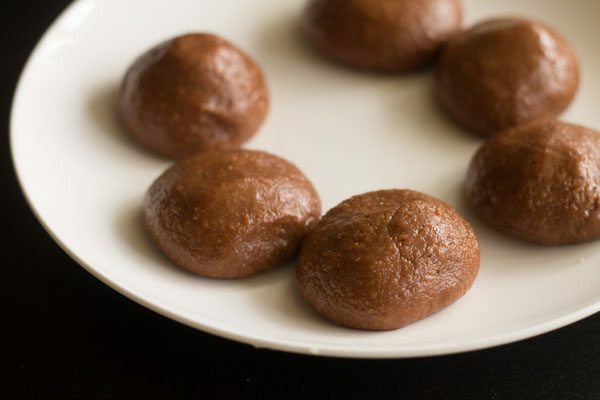 these chocolate modaks are prepared mainly from three ingredients chocolate, mawa/khoya (evaporated milk solids) and sugar. 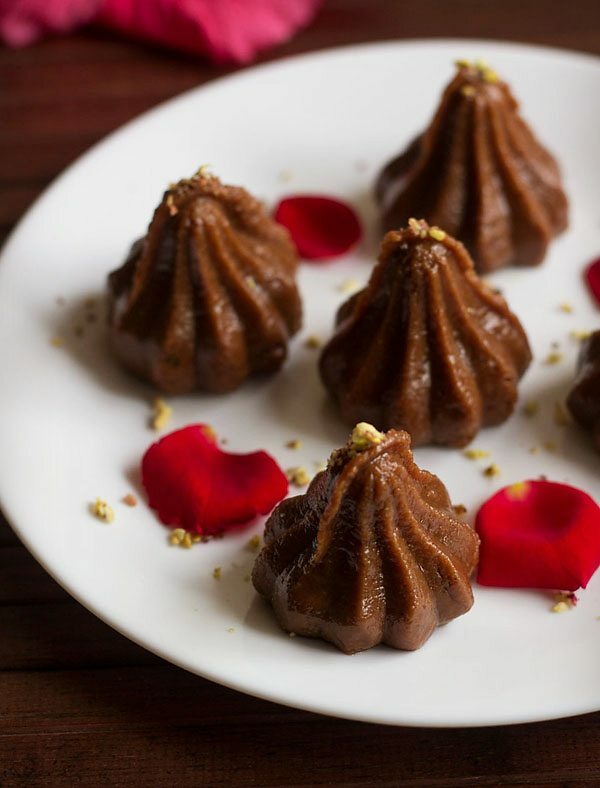 this modak recipe takes less than 30 mins to make and is simple to make during festive seasons. 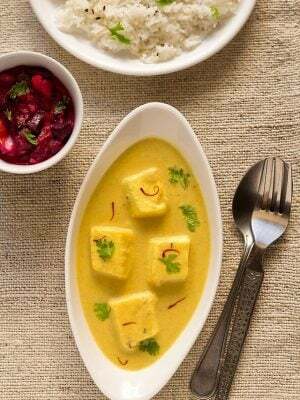 it is similar to the recipe of mawa modak. i had mawa and chocolate both, so thought of making chocolate modaks. 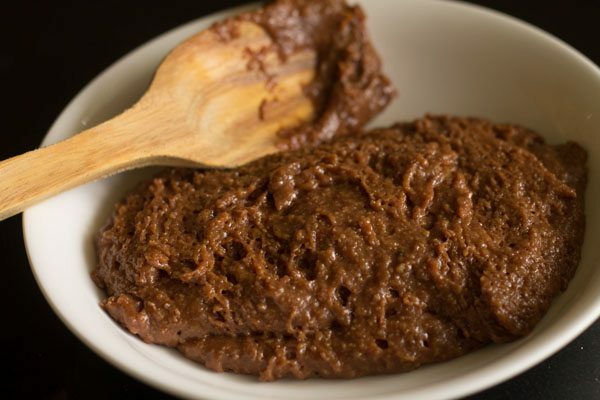 everyone is fond of chocolates and to include chocolate in modaks would be favorite of many people. 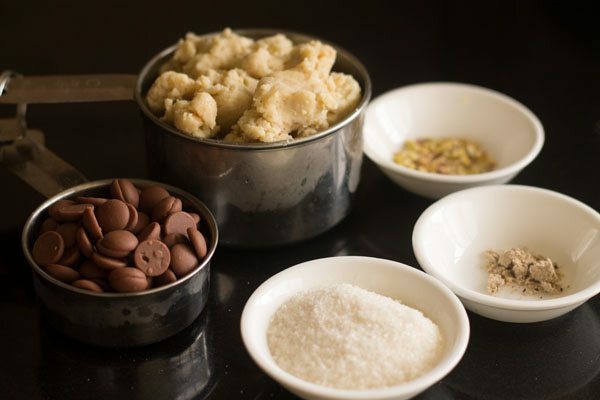 you could make this as offering for lord ganesha or serve as a sweet dessert to family. kids would surely love these modaks. i have used chocolate chips but you could use grated chocolate of any good brand. 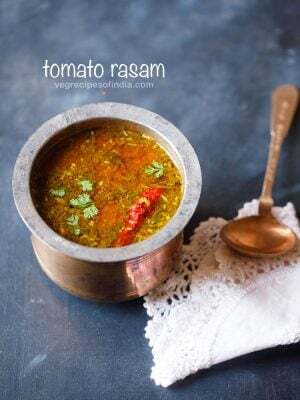 mawa used for this recipe is unsweetened mawa. further to give more flavor and aroma, i have sprinkled freshly ground cardamom powder. for variation you could use vanilla extract or cinnamon powder instead of cardamom powder. 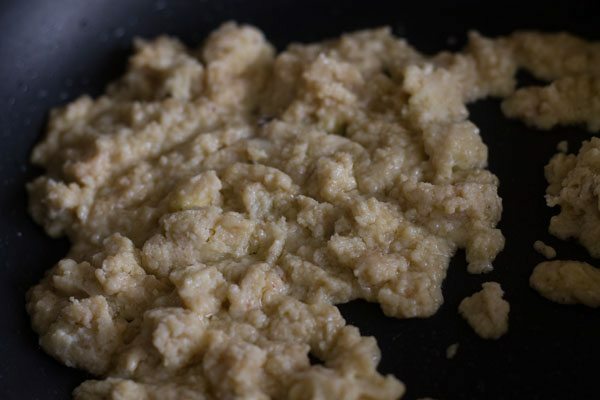 mawa or khoya can be easily made at home. 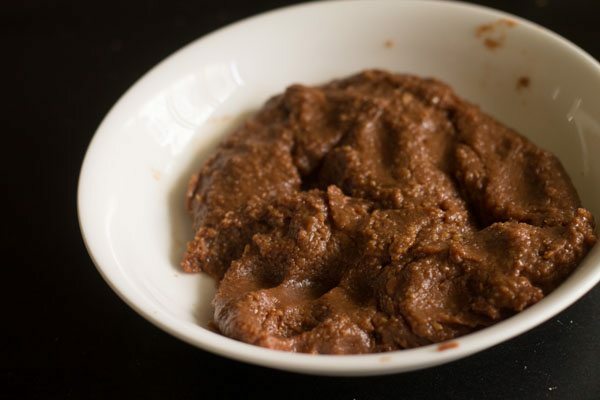 you can check this recipe on how to make khoya at home. 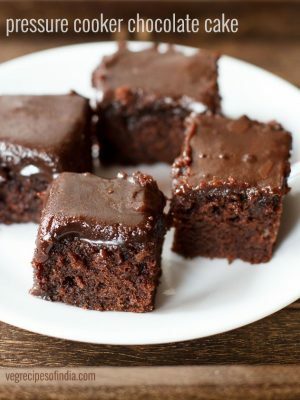 the best part of these chocolate modaks are that you could refrigerate them for 5 to 6 days. these modaks taste best when they are served chilled. modaks are loved by our folks be it ukadiche modak, fried modak, dry fruits modak, rava modak or sweet kozhukattai. i have garnished them with finely chopped pistachios and rose petals but it’s optional. 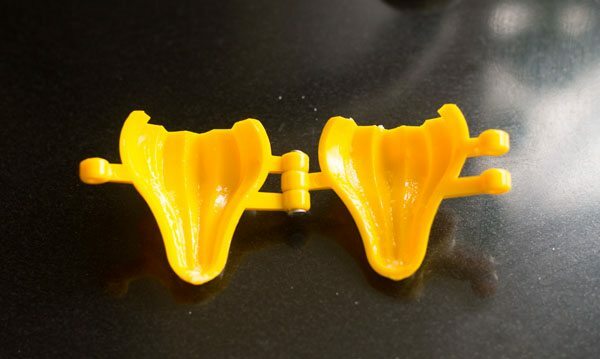 i have used modak moulds for chocolate modak but you could also use chocolate moulds. 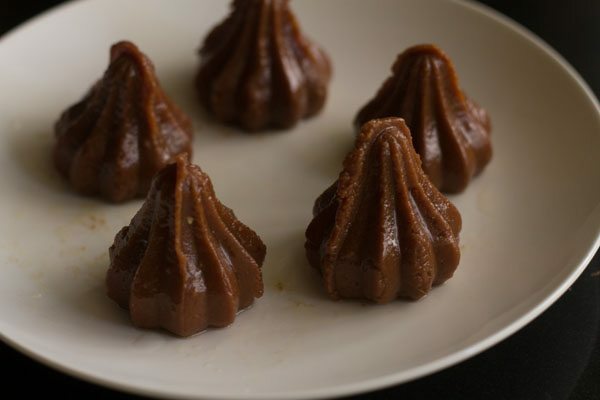 if you don’t have moulds then just shape them into modak or make small balls like pedas and serve. 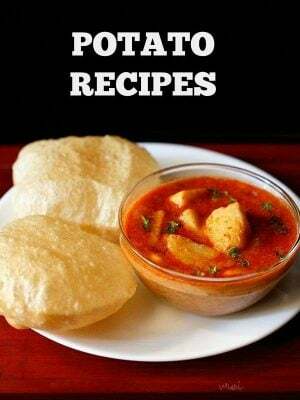 if you are looking for more ganesh chaturthi recipes then do check puran poli, coconut ladoo, rava ladoo, patholi and motichoor ladoo recipe. firstly keep all the ingredients ready for the modak. 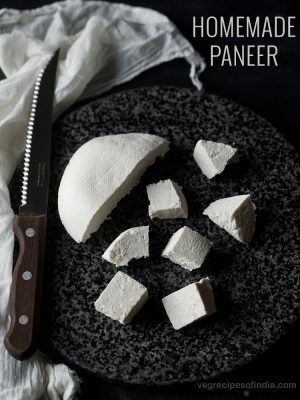 grease the modak moulds with a bit of butter or ghee or oil. place aside. heat a pan. 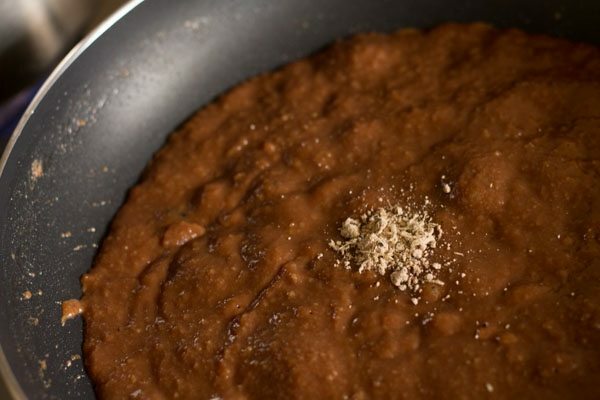 keep the flame to a low and add grated mawa. keep stirring on low flame for a minute. soon the mawa would start melting. 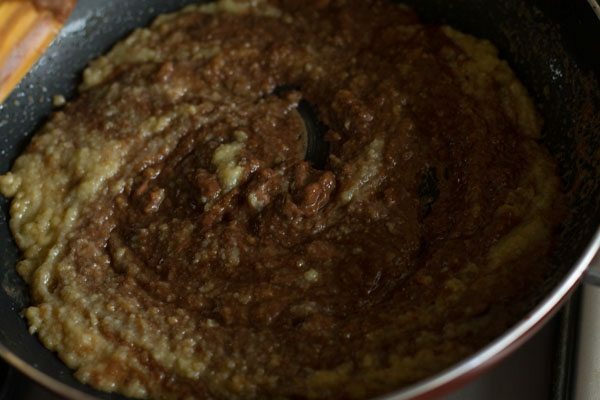 when the mawa begins melting, add sugar in the mawa mixture and stir for a minute. you would see the chocolate chips melting. keep stirring on low heat. the mixture will start thickening. continuously keep stirring. keep stirring on low flame until the mixture starts leaving the edges of the pan. do not overcook as then the modaks will turn out dense. 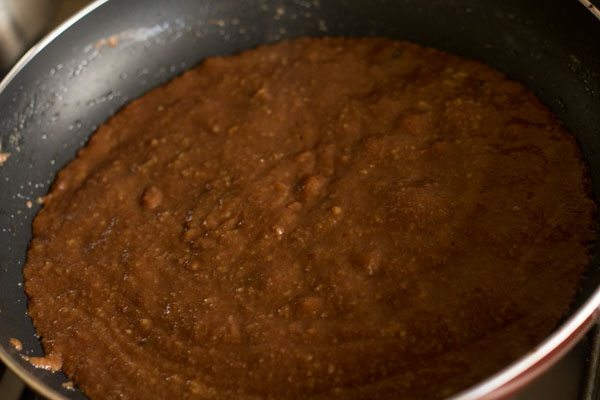 immediately transfer the mixture in another bowl/dish/thali. make small balls from them. place a small ball in the modak mould. gently unmould and repeat the same with the rest of mixture. place the modaks over a greased plate/thali. garnish with rose petals, top with finely chopped pistachios. offer chocolate modaks to lord ganesha. 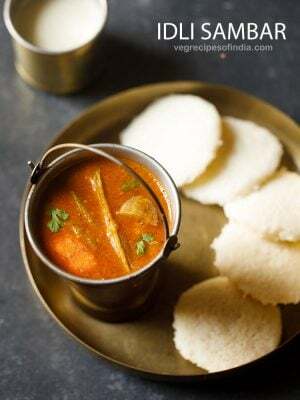 these modaks can also be chilled and then served later. 1. firstly keep all the ingredients ready for the modak. 2. grease the modak moulds with a bit of ghee or butter or oil. place aside. 3. heat a pan. keep the flame on sim and then add the grated mawa. 4. keep stirring on a low flame for a minute. 5. soon the mawa would start melting. 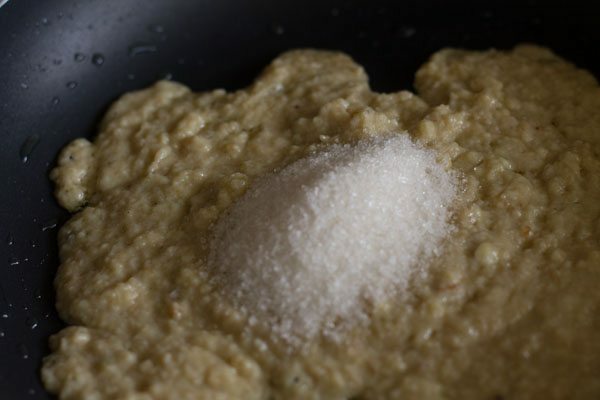 6. at this stage add 2 tablespoons sugar in the mawa mixture. you can add less or more sugar as required. 7. stir for a minute. 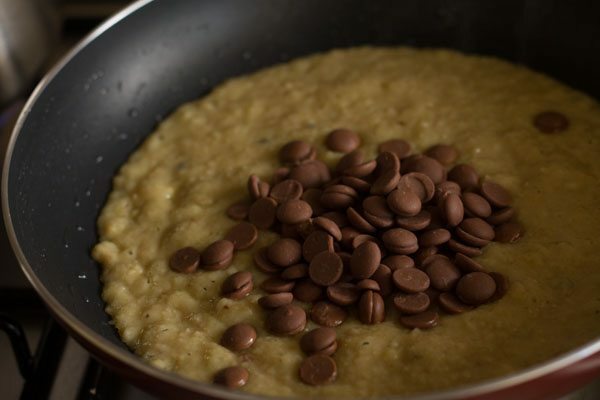 8. quickly add ⅓ cup chocolate chips. use good quality chocolate chips. here i used callebaut belgium milk chocolate chips. 9. you would see the chocolate chips melting. keep stirring on low heat. 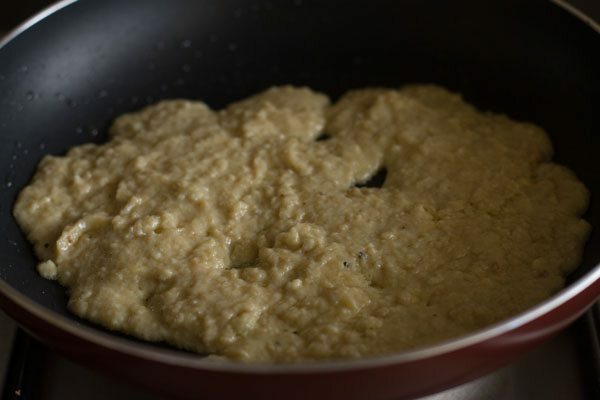 10. the mixture would start thickening. continuously keep stirring. 11. sprinkle ⅛ teaspoon cardamom powder. 12. keep stirring on low flame until the mixture starts leaving the edges of the pan. 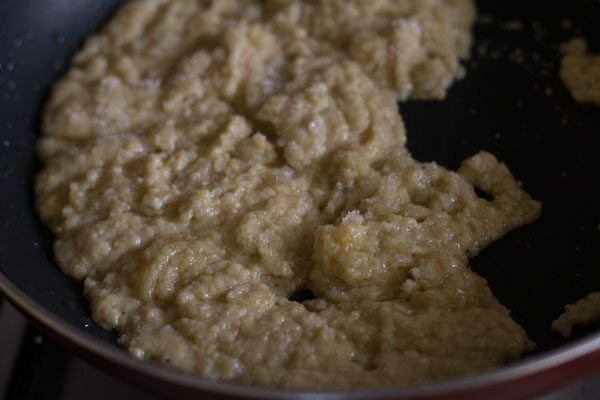 do not over cook, as then the modaks will become dense or hard. 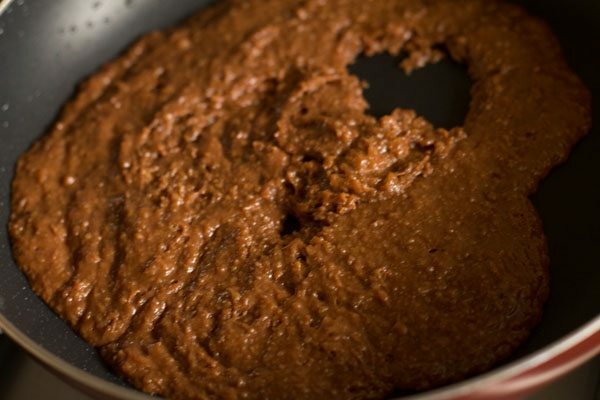 13. immediately transfer the mixture in another steel or glass bowl/dish/thali. 14. allow the mixture to cool. 15. make small balls from them. 16. place the small ball into the modak mould. just press with your index finger towards the center of the mould so they get the shape of the mould. 17. gently unmould and repeat the same with the rest of mixture. 18. place the modaks over a greased plate/thali. garnish with rose petals, top with finely chopped pistachios. offer to lord ganesha. or you can chill them and serve later to your family. 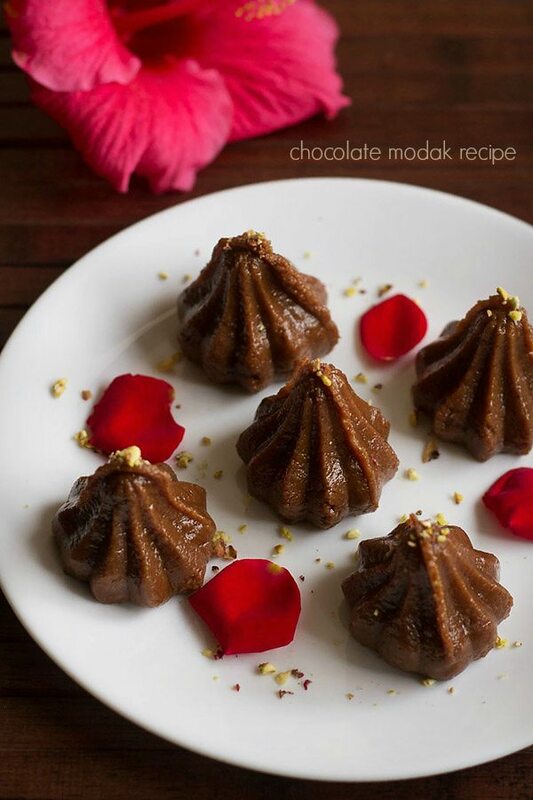 I made chocolate modak recipe. yummy taste and awesome texture and liked by my in laws and my friend and close ones. Welcome Meeta. 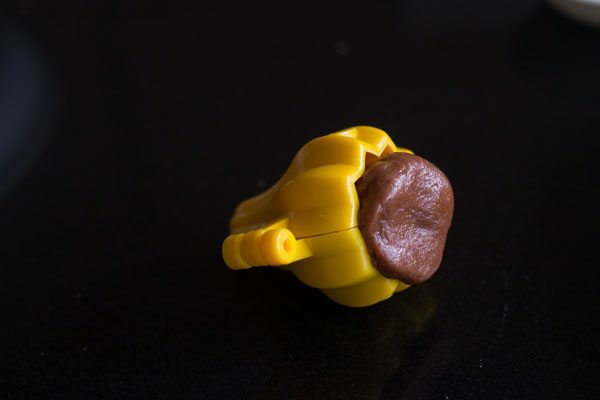 Glad to know that you liked chocolate modak. Hi..i tripled the recipe..the taste was really good..but i did not get the firmness to shape them well..what could be the reason? could be that the modak mixture needed to cook for some more minutes. 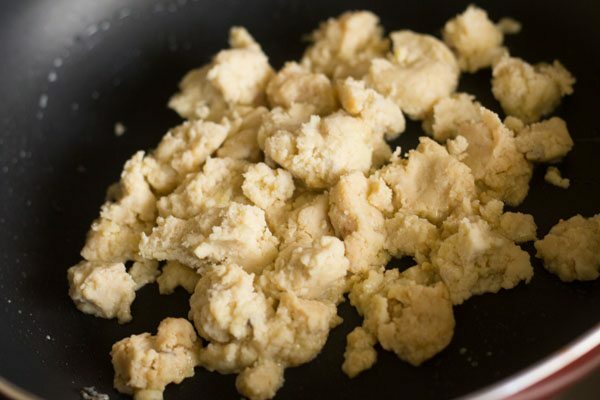 if the mixture is not cooked properly, the shape also won’t come well. Mam your recipe was damn fabulous n the measurements were so precise for 21 modaks.. I made the modaks N offered to god, my neighbours n my friends.. They were just awestruck with my cooking skills but the real hand was yours in the modak making process… N all r asking for the recipes..so happy. Thanks Chandrika for this awesome feedback. Glad to know that I was somewhere involved in background while offering modak to Lord Ganesha. Hi Dassana, thank you for the recipe, can we double this? shreya, yes you can double the modak recipe. 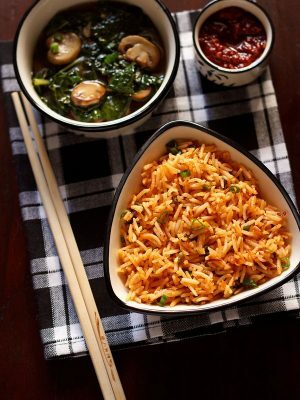 My brother always cooks this to cheer up my mood……..
hi! i do not know where to put this comment but just wanna inform that when i favourite something and switch off and switch on my phone, whatever i favourited is gone. is there something you could do about this? we have given a recent update on both android and iOS. so with this update the favorite issue has been rectified. please update the app and if the issue persists than do let us know. diana, this copy paste option has costed me a lot of trouble. there are many illegal apps, ebooks and websites/blogs that have copied word by word content and pictures from my blog. it gets increasingly difficult for me to pursue them. the numbers are increasing day by day. recently i reported about 10 to 12 apps on google play store for plagiarizing my content. there are many such websites and blogs doing so. i also reported one blog which was copying content not only from me but from other bloggers too. this particular blog copy pasted word to word and was making recipe videos from my recipes, just changing the quantity of ingredients. so all these folks who copy want to get quick recognition and fame by using other people’s hard work and not on their own merit. all these things give a lot of pain. i am helpless as i have this one option of disabling the right click, which can prevent possible thefts in the future. i hope you understand my situation as i am struggling with these issues. very tempting. will try for sure.